From the first game in the series, Fallout has used the helpfully acronymed S.P.E.C.I.A.L. system for character stats: Strength, Perception, Endurance, Charisma, Intelligence, Agility, Luck. 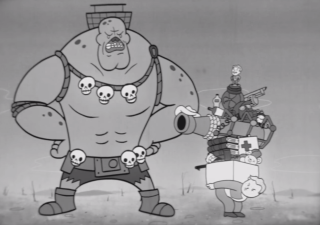 Each has different effects on your character's ability to cope with the post-apocalyptic wasteland and, in order to explain how some of those effects will play out in Fallout 4, Bethesda is releasing a video series, the first of which went up today. In true Fallout style, these videos are in-character crackly black-and-white infomercials about rebuilding the nation after the nuclear disaster. This first one's about strength, and the benefits your character will get from having more of it. First up, higher strength means a larger inventory, which makes sense even if it doesn't explain how even the weediest of characters are able to carry several metal weapons without breaking a sweat. There's also the familiar over-encumbered state, in which carrying more than you can handle makes it more difficult to run away from danger. Next up, higher strength obviously makes you able to deal out more damage in combat, whether that's with your fists, a ripper, a bat, a nail board, or a power fist. Keep watching for what happens when hand-to-hand isn't enough. Personally, I tend to give my Fallout characters pretty low strength. I prefer to talk my way out of a situation if possible, and when it does come down to combat I'm likely to be too far away for punches, probably using V.A.T.S. What are your typical S.P.E.C.I.A.L. stats?